I have the privilege and pleasure to have been at the launch and tasting of the Carlsberg Rebrew project – The Father of Lagers, and so this post is all about a remarkable beer, in appreciation and in awe of the audacity and result. You see that I’ve skipped in numbers to (1)883 – but then again I’ve always done it my way and because I couldn’t wait to have a perfect alignment. I do know what the beer tastes like, I was at the New Zealand tasting, in a crowd of around 80 people who got to sample from, what I understand, was only 400 bottles of the 4000 available world-wide. I did also mange to secure on to bring home. This then somewhat a sponsored post, certainly a beer you can’t buy and a departure from the normal fare of beers you can buy, this, for me, a little be special. I’m drinking bottle #3690, this the grand 750ml bottle, a beer with cork and cage, with an ABV of 5.8%. This is 2.9 standard drinks of beer, and about 174 calories a serve size. Using sophisticated techniques, Carlsberg Research Laboratory has rebrewed the world’s very first quality lager. It is brewed with the original pure yeast which was developed at the Carlsberg Lab and which revolutionized the world’s beer brewing in 1883. The yeast has surprisingly survived 133 years in a beer bottle in the brewery’s old cellars, and leading brewing experts have now managed to rebrew what is considered the father of most modern day lager beers. To celebrate the 140th anniversary of the Carlsberg Research Laboratory, leading scientists and brewers at the Laboratory have now rebrewed the world’s first quality lager in the most authentic manner, using the original pure yeast and the exact same recipe, ingredients and brewing techniques as in 1883. The beer is neither filtered nor pasteurized, but has cleared somewhat through natural sedimentation. However, yeast sediments and haze might occur in the re-brew lager. Historically, gelatinwas occasionally used to clear beer but the need to do so withre-brew seemed unnecessary,due tothe use of purified yeast. So, we have not used gelatinor other additives in the re-brew lager. I spoke to the NZ Brewer for Carlsberg, this is a beer that should cellar well, he thought there was still a while to go before this had brewed out to potential, the yeast he thought a slow burner but would carry through, if only I had the patience. The most disappointing this, the cork. I get that they’re expensive but they could have gone the whole hog and used whole cork and not the compressed ones. To be picky. Light pop on opening that gives way to a distinctly yeasty aroma,, and then also I thought milk chocolate of a sort, but it’s very bready really. Pour is a deep brown red, and very clear, incredibly clear for a non-filtered and unpasteurised beer, but it’s not overly carbonated and is then seems somewhat flat in the glass, that lovely light brown head didn’t last long, but settles into a decent film of foam. The first sip full sugary, slightly lightly bitter, soft and surprisingly tasty. Ir washed over to a slightly dry finish, but delicate and as if an afterthought The lingering mouthfeel is one of sugary sweetness. What you notice is that this is really really easy to dink, there are no kicks or weird edges or peaks to catch you, but then German Lager is very much still the same, the persistent use of superior yeast. malts, barley and water tends to do that. I’d love it so much more if this was slightly more carbonated really. The beer then after the excitement of trying settles into a daily yeasty ready groove, and this only highlights that this is beer that has a couple of things that I’d like to add. What you don’t notice, because you can’t, because there isn’t anything to suggest it, is the alcohol in this, and whilst only slightly more than a domestic beer, it isn’t obvious. Dangerously easy to drink I’m sure that beer like this would easily make the fridge staple. The pdubyah-o-meter rates this as 11 of its things from the thing, well no, actually I’d really rate this as 8 things on the scale. 8 is very good. It gets 11 for the story and the journey and for me being completely on board with this as a project and beer. A Vienna lager, the best other one I had was from Schippers in NZ , than again I’ve not had that many, and possibly a style that I’d be really happy to explore more. Where did I get it? 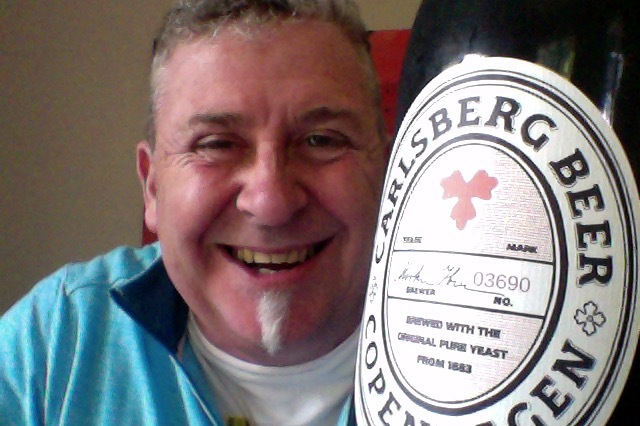 Carlsberg in New Zealand, it’s not available to buy or win, you have to get it by invitation. Am I enjoying it? I was blown away by the history, story and the taste. And it’s decent beer, honest to goodness quality beer, nicely done without fancy. Would I have another? They might go again in say another 50 years, If I’m around I’d be annoyed to miss out. Wonder if they’d invite me back? Would I share with a friend on a porch and set the world to rights? Yes, hands down the most spectacular back story of any beer I’ve ever had. Can’t tell you how much I share this story. As for the beer, well it talks a good beer. Actually I’m not sure it talks a ‘good’ beer. it talks about original and authentic old beer, and if this was the start then it was really high bar straight out of the traps. Brilliant afternoon, Lovely beer and brilliant vinyl. What more do you need? 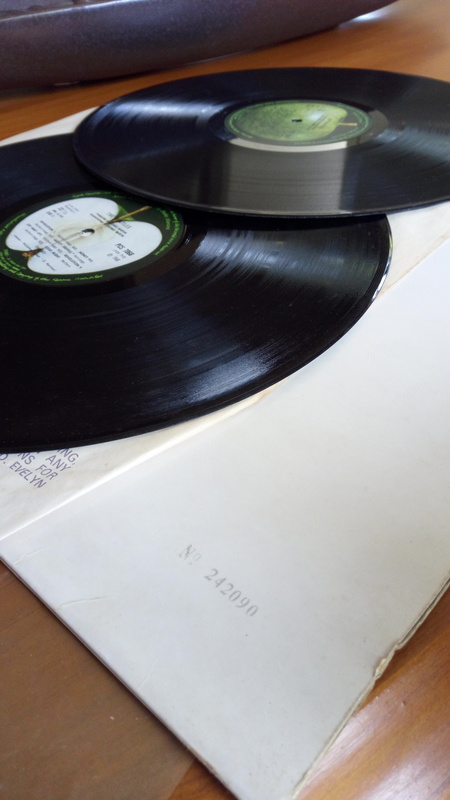 Music for this: ” The Beatles ” and their album ” The Beatles – also known as the White Album” on original 1968 Vinyl, you can listen along on Spotify of course. Original vinyl was about 50 grams none of that 180 gram nonsense, floppy as heck. 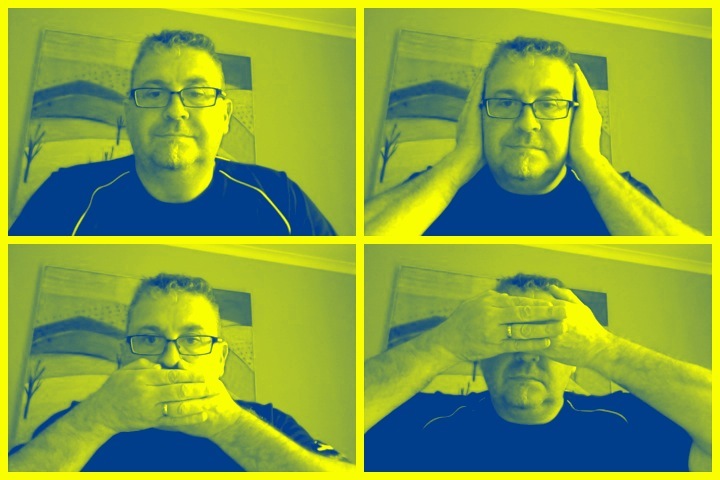 hiss and pop abounds, it’s been loved and I’m really loving it now. The Beatles, also known as the White Album, is the ninth studio album by English rock group the Beatles, released on 22 November 1968. Although no singles were issued from The Beatles in Britain and the United States, the songs “Hey Jude” and “Revolution” originated from the same recording sessions and were issued on a single in August 1968. Mine is an original #242090 in average well played and loved condition bus hasn’t been played in years. So it could end badly. Hiss and pop included, 8 tracks on side one, this is a completely chock full album of good music. Turned up to 11 of course. 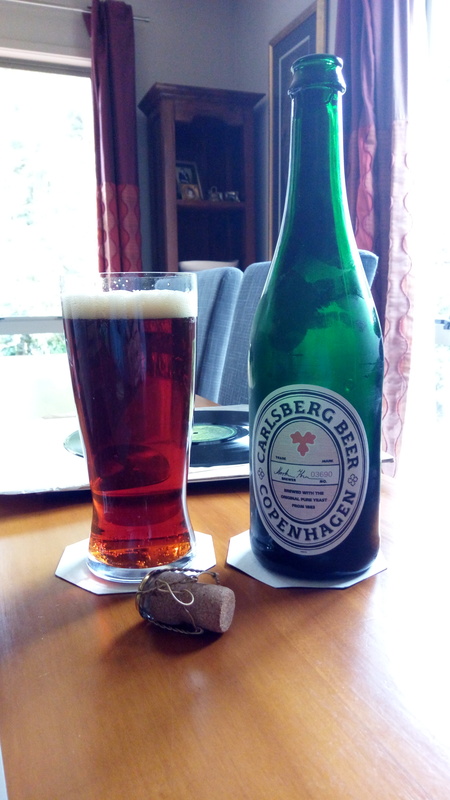 This entry was posted on October 16, 2016 by Philip Walter in Amber Lager/Vienna, Beer of Denmark, Beer Review, Carlsberg, Craft Beer, Critic, Justsaying, Nostalgia, Simple Life, Vinyl and tagged Beer, Carlsberg Group, Carlsberg Re-Brew Project, Carlsberg the Father of lager, Carlsberg the Grandfather, Copenhagen, craft beer, Denmark, Probably The Best Lager In The World, Probably The Oldest Lager In the World, re-brew project, Vinyl on Sunday.